Halloween Forever page 8. Final page! Become the True King of Halloween in Halloween Forever! Welcome to page 8, the final page! I’m so excited. Partly because I’ve never made a comic tying into a game before, but also because I’m done working on the comic and can go back to working on some more additional features and content for Halloween Forever itself. 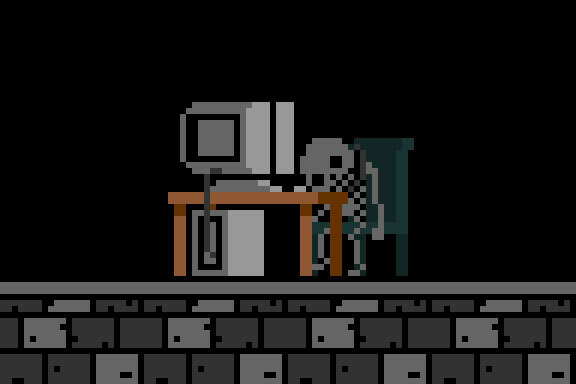 New comics will probably be on a hiatus for a little bit but I will be posting news about gamedev updates, new streams and videos, and especially once Halloween Forever is available on Steam. Itch.io purchasers can redeem a Steam key as well. Ok, where to begin? It’s been nearly half a year since I updated the build but I’ve been working steadily on things since. Straight from my basement to your home, here comes version 1.03. – Player knockback. Taking damage triggers a knockback state. – Player firing has some limits depending on the character. You may notice it more if you’re standing on a ledge firing bullets into a pit (bullets are on screen longer). – Each world has a miniboss and world boss now. I left the original world bosses as world bosses and new minibosses are intermediate within worlds. – Some old bosses may have gotten a health boost. – Screenshake effects added in some instances for when impactful things happen. – Worlds are longer, more rooms to them. These may get longer still. – There are now ladders and jump through / drop through platforms. Adds some much valued variety! – Added some checkpoints. If there are too many I may remove some. I’ve felt like dying and needing to retry a world from the start is kind of arbitrary difficulty for a while. – Transitioning between rooms has a visual effect and looks less abrupt/choppy. – New music for Bloody Mansion and Mystic Ruins (I keep calling it Forgotten Stonehenge accidentally)! – Unlockable characters! There are three hidden in the game so far (look for hidden or not hidden pink doors). You need to find them and win your run to successfully unlock, but then the unlock should stay persistently. Unless you reset your unlocks (you can if you wish…) Unlocks save separately from your configs. – Control config saving may have never worked properly, but I think I fixed it this week. – Separate music and sound effect mute toggles. Should save with config. – I might be missing something else still. It’s been a loooong time, gradually adding updates. If I remember anything critical to mention I’ll append some stuff to this. – Some tile placement around levels can be a little patchy. Still needing to fill in walls and things so everything looks solid. – I need to do a big sound effects pass throughout. Some things may be temporarily quiet and lacking some flavor. – Still no achievements or trading cards. Looking at that soon. Achievements will probably get implemented last so they can be built around the fullest frame of content in the final build. – New characters yes, but the endings are all Pumpkin Man endings. This should change. – I haven’t extensively tested the secondary characters attacks. They’re fun and all generally more powerful or interesting than Pumpkin Man’s candy corn shot. I’m intending them to be fun NG+ options to play around with, plus the character skins add some fun variety. BUT, if anything seems grossly unbalanced or terrible let me know. Open to revisions. – The controls text on the title screen doesn’t reflect changes to your keyboard configs. I’m probably going to remove this. – No gamepad config as of yet. It’s not awesome, but the keyboard config setup plus JoyToKey might be a robust option for people without an xbox form factor gamepad. – Finish up world 4, finish up world 5. With all the updates in 1.03 this represents roughly half of what I have planned for the final game (maybe a little bit more). 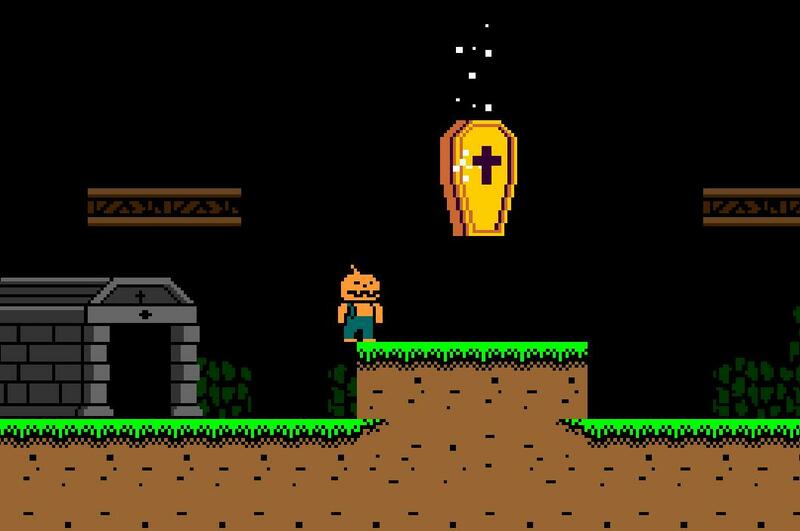 I have some world 4 and 5 content already in the works and maybe we can wrap things up before Halloween 2016. I’m sprinting, having fun doing it and hope you enjoy what’s getting put into the game! Please let me know what you think! 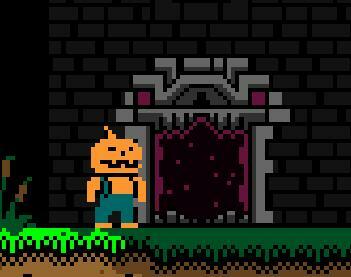 ESPECIALLY if you are totally new to Halloween Forever and haven’t explored these levels or fought these bosses. I’m very interested to know how much time it takes you to clear the game (rough cumulative gameplay time, vs. how much time your winning run took). It helps me gauge the time-in players are going to get out of this experience. Since the big negative from early feedback was the game was too short for players I really want to address that. Any bugs or issues you can find too, let me know! 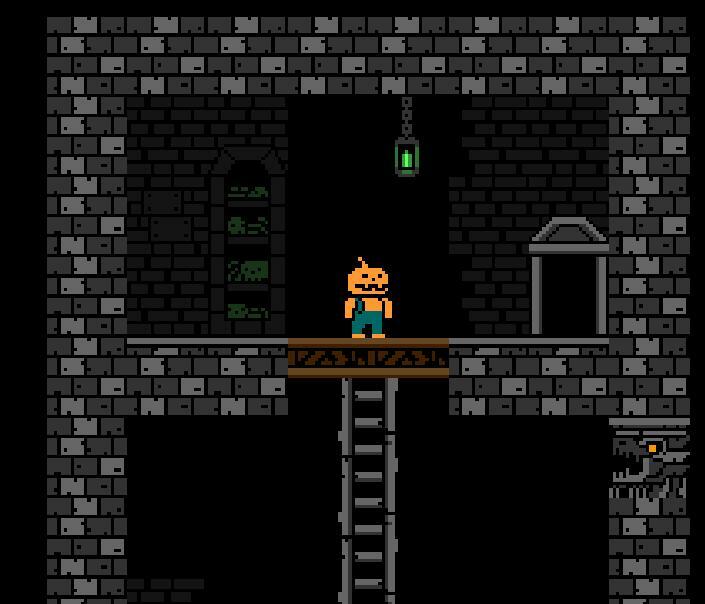 Check out Halloween Forever on Steam Early Access to get the game. 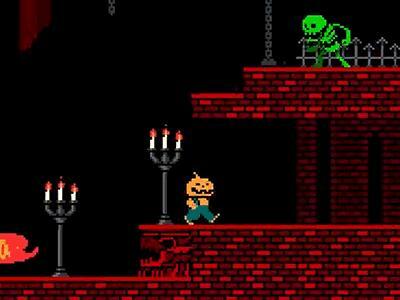 If you want a spooky and tough retro platformer to play, Halloween Forever is for you! This is bad when I can’t remember the literal name for a zone in my game! 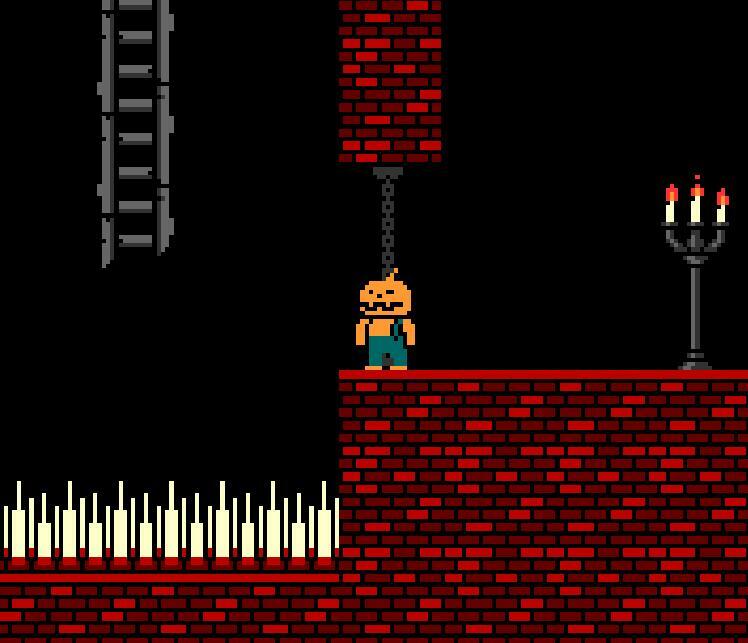 Either way, “World 1” is getting some new rooms and also will be the first place you encounter ladders in the game. Check out those purple crows! They’re another proximity-check enemy (similar to what I’m doing with chainsaw maniacs and mashers). In doing them I learned a slightly more elegant way to check a distance radius vs. the player instead of doing a wide clumsy sweep for collision (will be helpful for future things. 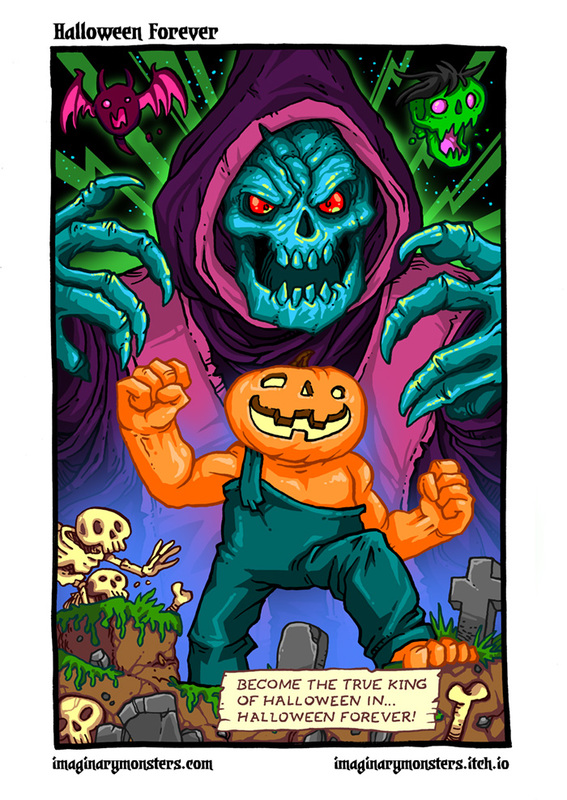 Here comes the giant chainsaw maniac ready to carve your pumpkin in a most dangerous way! 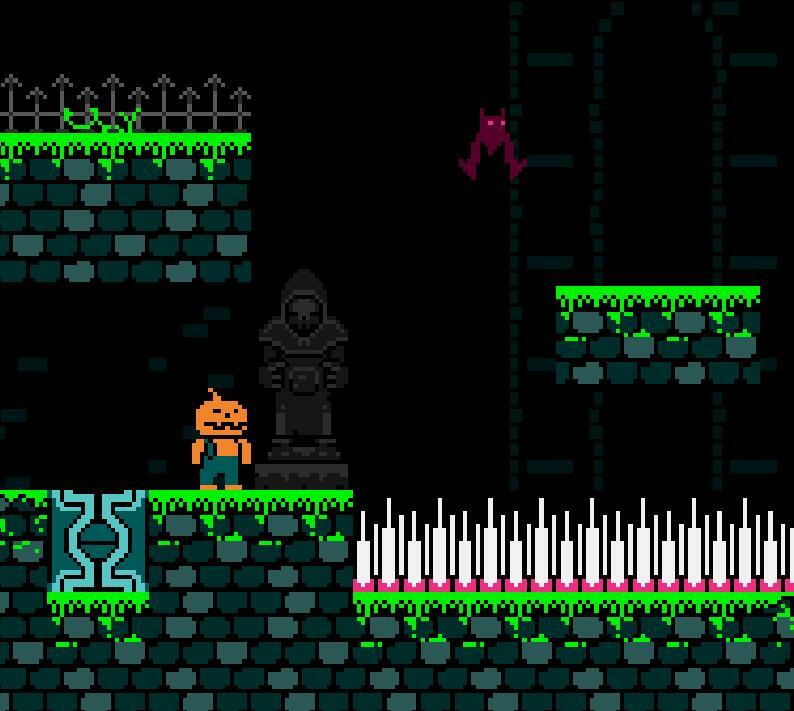 I intended to make him the Graveyard miniboss but he might swap places with big bat to better pace out challenge ramping. 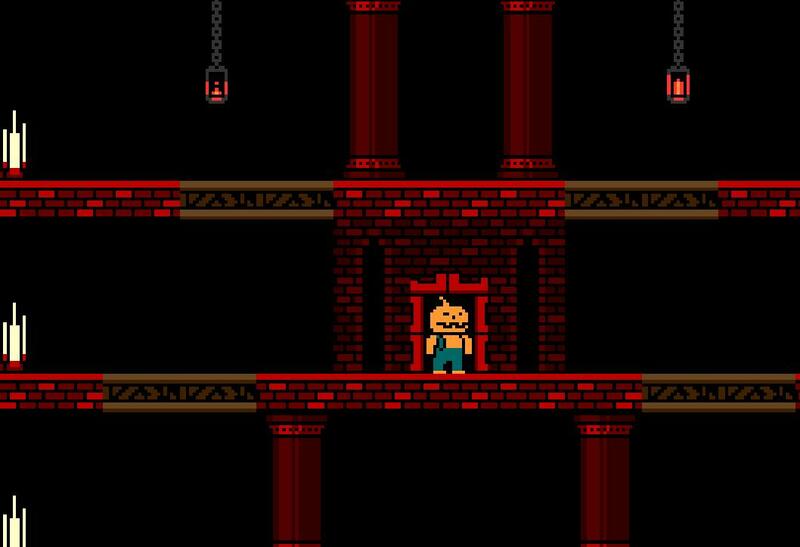 It will take a little more testing from people and finding out their first experiences versus him, but so far giant chainsaw maniac seems like a good, tough boss challenge. Bloody Mansion just screams “give me some cool tricks and traps” to me so I’m trying to oblige. We start to do some fun things with fall away platforms here. And also there are going to be some nice decisions to make about how best to navigate deadly ladders like this in the same room. The new miniboss for Bloody Mansion is the fearsome two headed hydra! Careful navigation of the drop through platforms and watching out for floating hydra heads that enter the scene is key here. I’ve been adding a few different wall tiles and decals to spruce up some of the level locations. The necromancer statues give a fun clue as to who you wind up facing at the end of Forgotten Stonehenge. I’m really happy with how the eyeball skull miniboss came out. Watch out for his giant exploding eyeballs! I’m going to bullet list some of the other things that are going on that don’t necessarily have images to accompany them. At the end of boss fights, instead of triggering a room transition at the end of the boss death, I’m introducing a new door that players can enter to go when they are ready. This gives me some options for timing and trade offs like creating a power up that players can grab before moving on. In general it just feels better for player agency. When you transition from room to room, the immediate transition has always bugged me. It’s too snappy and if you start a new room at a different visual position from where you ended in the previous room that can be jarring. I put in a simple graphic transition effect that adds a nice visual break point to moving into a new room. 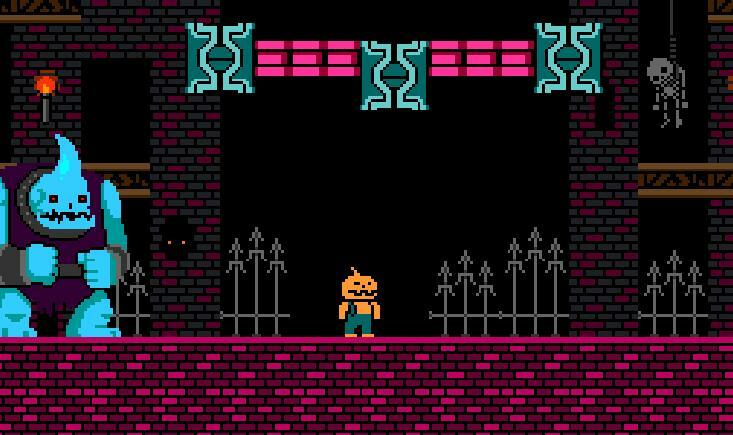 Going to be working on a “walking into a doorway” state for Pumpkin Man to add a bit more polish to events like this. 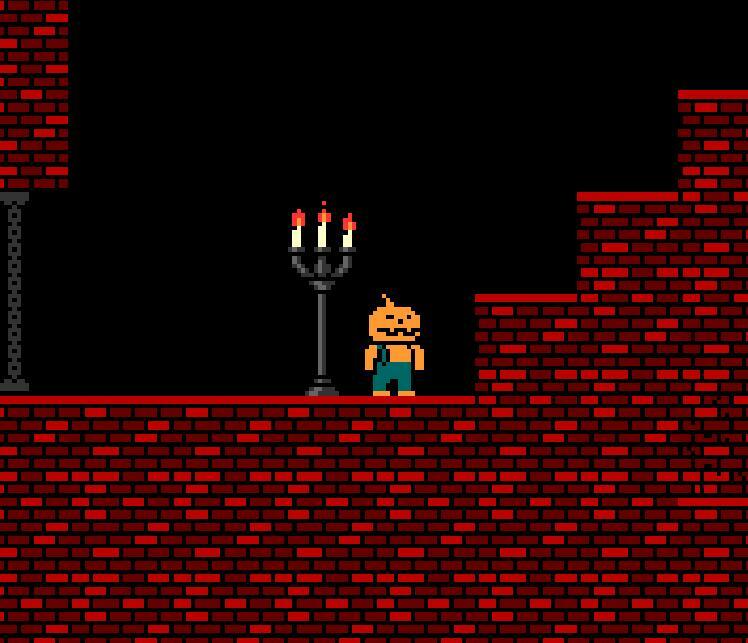 I started the framework for getting alternate player characters in the game (read: Butternut Bro). It’s going to require a character select menu, new player skins, and wrapping your selects / unlocks into the save file but I want to have the start of this in for the upcoming Steam update. This and wrapping up Forgotten Stonehenge rooms are what I’m working on next. I wanted to call this “The Dev Blog to End All Dev Blogs” but that wouldn’t be true since I still have more work to do on Halloween Forever. Anyway, here goes! It’s been weeks since I published my last update but lucky for me I have been getting work done at a regular pace. Where to begin? Blue Demon Boss is done! From either corner of the room he will either spit moths or do a jump attack (and grab you if he hits you). 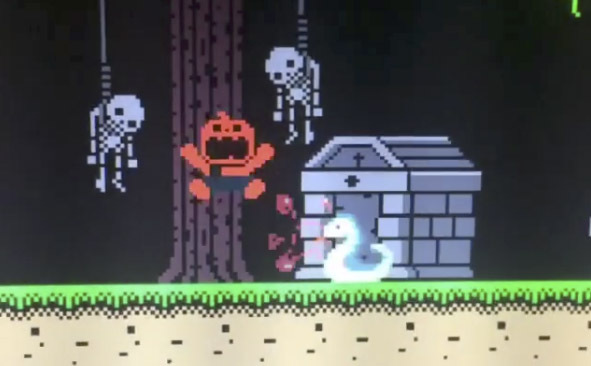 The trigger spikes and fall away platforms make this the most dynamic boss room in Halloween Forever yet. 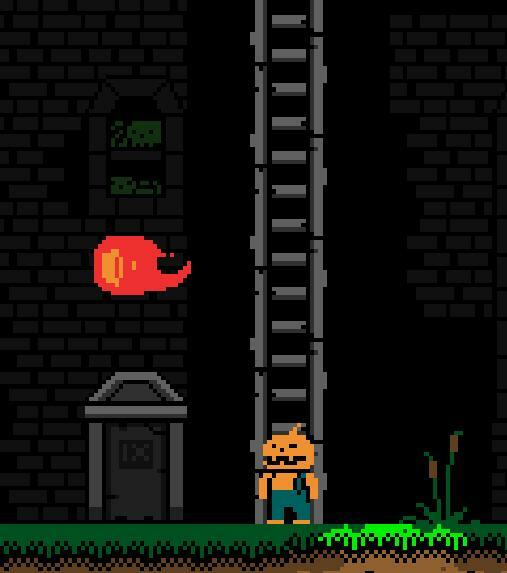 After some research in tutorials and some good refactoring of the player state machine I should have done a year ago, I was able to get climbable ladders in and working. With ladders plus drop down platforms and fall away platforms it’s feeling like I have a lot more tools to make some interesting level design come together. Even something simple like this long ladder with the fireball spitters feels super fresh to me. I’d still like to add a couple more platform types if I can swing it. Maybe a conveyor belt (if it makes sense in the context of a world), or moving floating platforms. There may be another trick or two up my sleeve yet. 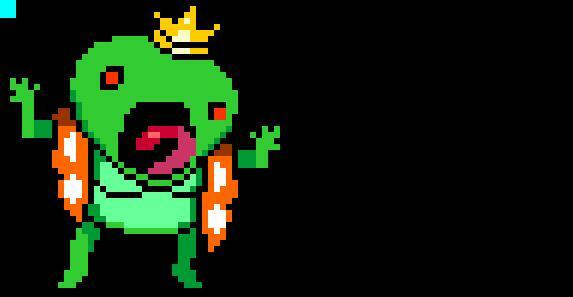 Frog King is the boss of World 4, the Spooky Church. He’s the biggest and fattest of all the frogs that have overrun this swampy abandoned place. Here’s a small glimpse of some animation process. 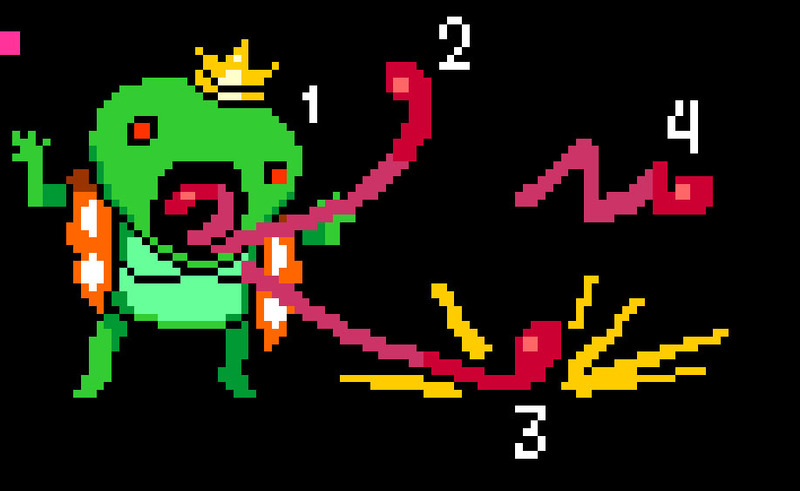 I sketched out some keyframes for the Frog King’s tongue whip attack. Keeping it loose and dynamic. After some animation and timing we have the tongue whip attack plus effects ready to go in the game. This came together pretty quickly. Now I can cause some screenshake to happen thanks to some added flexibility in my camera controller code. I don’t think my screenshake will work in very small rooms (rooms where there isn’t any margin outside of the navigable level layout) but this seems acceptable to me. This was another small addition that is going to add a lot. Now doors leading into boss rooms will look more like a setpiece, giving players a heads up that they are about to enter somewhere dangerous! It’s not shown here, but I’m also in the process of adding checkpoints before boss rooms (similar to something like Mega Man), so if you die at a boss after traveling through what will now be a longer level you don’t need to start over from the beginning. This may change some things but I think it will let me add more real difficulty and challenge to the path that leads to a boss rather than having to restart over as sort of an arbitrary difficulty rule. 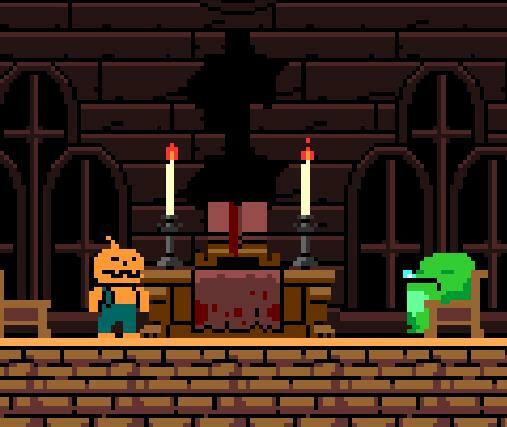 Next I am going to button up the Frog King boss and try to get the Spooky Church levels closer to final. This means probably adding a few new enemies and also working on another boss (miniboss!) for the Spooky Church. Once Spooky Church is done it can serve as the measure for filling out existing world content (Worlds 1, 2, and 3). One of the more interesting and humbling things about doing work while live streaming on Twitch is if I wind up making some big errors or creating a crazy bug, it’s all live on the internet. Also recorded in a Twitch archive temporarily and on Youtube more permanently afterward. Neat! Scary! It can be stressful for anybody making mistakes on a project in private. More so if there are issues of sensitive timing or budget involved. So why would anybody in their right mind want to do that on camera while tens of people (I’m still a Twitch babby) follow along? Maybe I am super cray. There are lots of reasons for this or else I wouldn’t be doing it. Trying out and liking open development, more chances for engagement with potential fans and new friends, keeping a measurable and consistent after hours work schedule, and learning that running a stream so far doesn’t radically disrupt my work flow or output is all excellent. But what about those game bugs and failures? It turns out that getting to share them the moment that they’re happening can be pretty fun! Ch-ch-check it out. 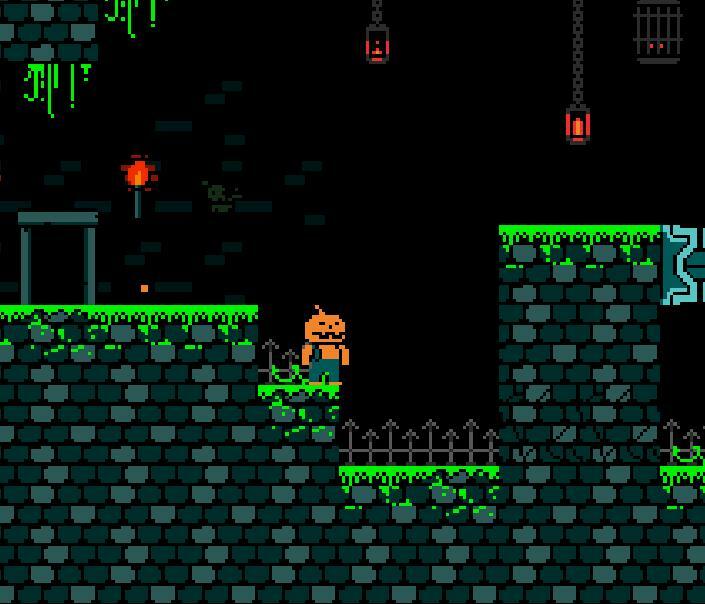 When I was setting up Pumpkin Man’s knockback state I had put in a bunch of placement values while trying to get the state to trigger at all. It turned out I forgot to change the state I was switching to in some copied code for about 20 minutes. Once I put the correct state name in, it worked! 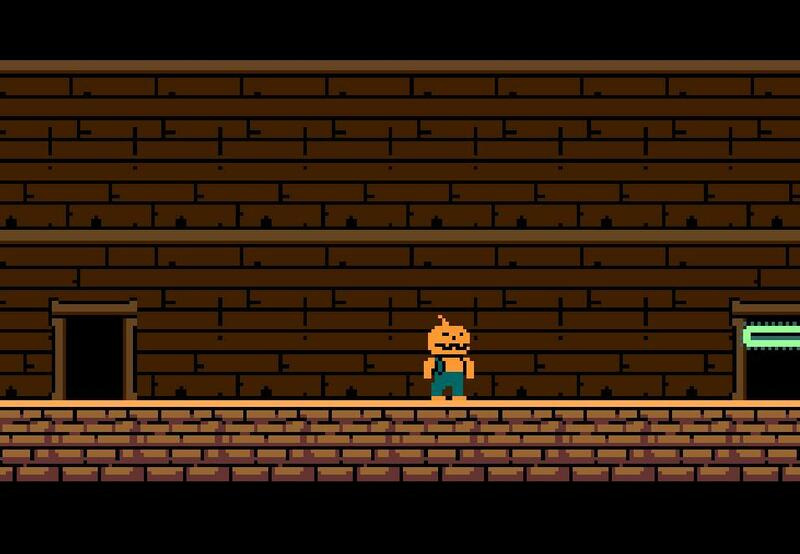 It worked so well Pumpkin Man would fly right off the screen and through walls and then fall and die in pits. Or he would fly away, fall onto an enemy and immediately zip off again. This was because my timer controlling the length of the knockback state was way too long and there was no deceleration on the x or y speeds. I didn’t expect this happening to be so fun for me but it got me laughing because it was so unexpected. This was a really weird one. Somehow I mistyped the name of an object I wanted to spawn when the moths died to something that didn’t exist at all in my objects set, but GameMaker didn’t crash. Instead it would spawn buttons from my control config screen (still clickable!) at the positions where the moths died. For a minute I thought something was really wrong. I mean reaaaallyy in a way that would just nuke everything and corrupt files. Turns out it was just one little bad object instance name. It was so strange though! Video games are fun. Making video games is fun. Errors and mistakes, with the proper mindset, can be fun too. You get to catch a glimpse of some shred of unexpected something happening. When you’ve been working on a long term passion project and so much of it is already measured and planned, this can be very refreshing. Also with knowledgeable people hanging out in your chat and offering meaningful suggestions in the moment, there’s so much room to be learning and solving it all as you go. It’s always nice when things go right but if something is going to go wrong, try to have some fun along the way. Last week I wound up spending only one night working on Halloween Forever stuff so I didn’t have as much to write up a full summary. With last week added onto this week’s additions I think there’s a nice chunk of progress to show. Player knockback is something I wanted in since before the itch.io launch but was intimidated to try. Partly not knowing where to begin and fears about needing to do some heavy refactoring in my player controller had me avoiding it. I never was really happy with how unresponsive getting hit by enemies and projectiles was…last week I decided to investigate and in a little over 2.5 hrs of streaming I had it in and (albeit rudimentary) working! I did some more touching up on it this week, making sure it hooked better into global player vertical speed and not being as much a separate thing from the player move controls. If you look at it in some of the videos below you might see some subtle changes. Indie Luchador’s favorite big blue demon started to get his states and boss arena sorted out. Also I found a temporary (maybe permanent?) home for these player tracking moths I made way back when but never had a place for. A moth coughing big blue demon is kind of fun. He could use one more attack, something that targets the top row of platforms. Probably something like a jump and maybe even a grab…! One way platforms is another thing that has been on my dev wishlist for ages. Late Wednesday night had me referring back to the Shaun Spalding tutorial on one way platforms and I had mine in and functioning in about 20 minutes. Right now they trigger when you press down but I will likely make it down + jump so you can still duck from bullets and flying things when standing on them. This week had another boss / miniboss coming together. 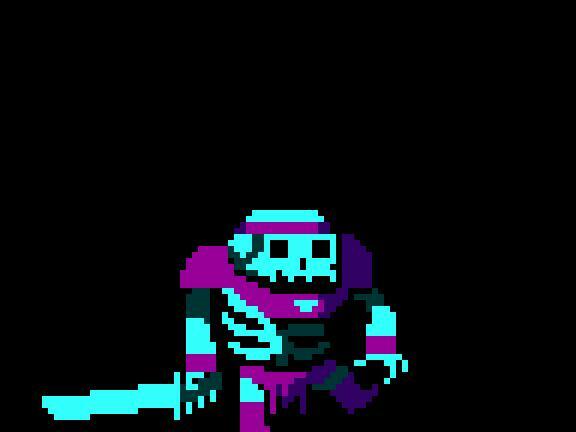 The big skeleton! Spoilers below if you don’t want to preview boss content! 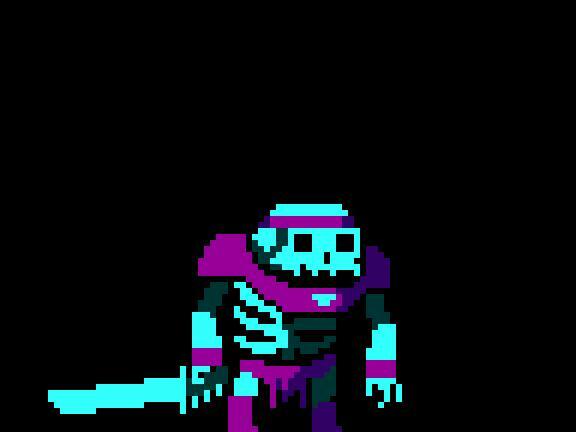 Big skeleton has a really big sword. He swings it at you in a pretty nasty overhead swipe. I’m thinking it will send out some shockwaves that you want to dodge (these will look similar to the slash from the blade itself). Also I spent some time in making his walk look pretty fun in a teeter tottery, jangly sort of way. While I was at the Game Dev Meetup this week I had a chance to mess around with some game objects. Using some of the base setup I have for the pop out spike traps I was able to quickly prototype a break away platform. The result is pretty cool! Not sure if these will have the same color palette and skin in final. I like the particles that drop off and them spawning clouds too. More importantly, I can see adding a variety of other collision based trick platforms for some good variety similar to these and the pop up spikes. This week I may do some more enemies and then transition into starting to code some of the new bosses I now have assets for. Aside from all this, I’ve been wanting to revisit adding a player knock back state for a little more platforming peril and not letting players just run through any hazard they have health for. Maybe it’s getting a little close to refactoring, but it could be a really nice gameplay feature. Hope you enjoyed checking out the updates! 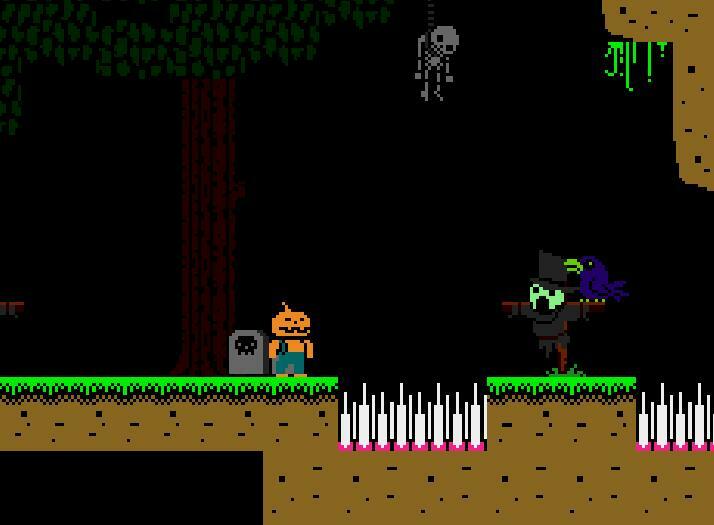 Check out Halloween Forever on Steam! Also come join me on Twitch when I’m streaming gamedev or playing games!